Just for crafters, one and all. ‘Cause we’ve been busy little elves. To make the season bright for you! Smoothfoam is a perfect surface for decoupage as it is dense enough for the decoupage medium to cling, yet results in a lightweight, easy-to-handle piece for altering and painting. 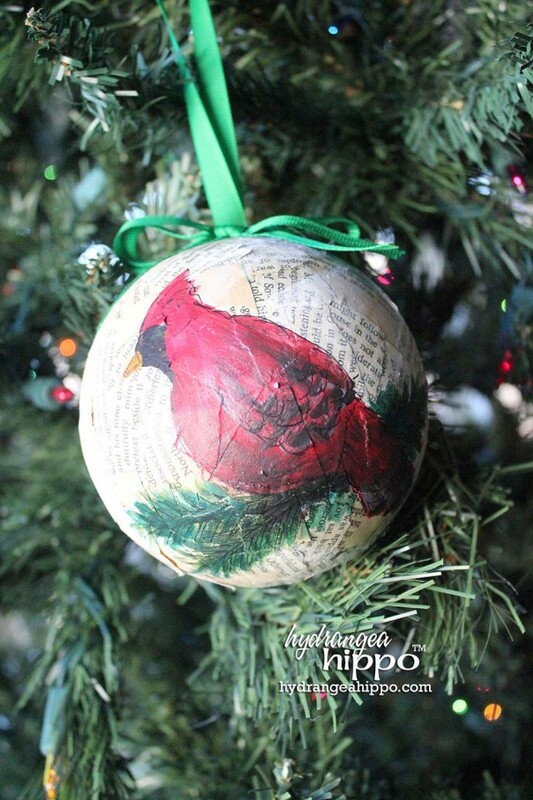 To create this Christmas ornament, I decoupaged a 4.5″ Smoothfoam ball with bits of brittle, vintage book paper before painting a cardinal on the surface. 1. Tear the book pages into small 1″ bits. Apply the paper to the Smoothfoam ball with Collage Pauge Instant Decoupage medium, one section at a time. Brush more medium over top of the papers to seal. Allow to dry completely. 2. Position the ball so the pre-drilled hole is at the top. Using a photo as a reference, paint a silhouette of a cardinal with red acrylic paint and allow to dry. Use a little black paint for the face, orange for the beak, and then use black and silver to add details to the feathers. Allow to dry. 3. Paint some pine branches under the bird with green acrylic paint, add pine branches under the bird. Highlight the bird and branches with Smooch Inks in coordinating colors. Outline the bird with a fine-point Sharpie marker. 4. To add a loop hanger, insert both ends of an 8″ length of grosgrain ribbon into the hole with a dab of hot glue, using pliers or tweezers. Tie another length of ribbon into a bow glue to the base of the hanger. This entry was posted in Holiday Crafts and tagged Animals, Ball, Christmas, Holiday Ball, Ornaments, Red by Jennifer Priest. Bookmark the permalink. I have been teaching papercrafting classes online and at events, charity crops, and local retailers for 9 years. My love of sharing, a passion for teaching, and a happy, whimsical design style drive my creative endeavors. I love to try new things and experiment with techniques that are quick and affordable.